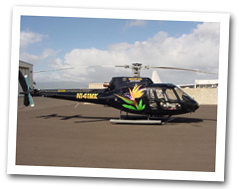 Best Helicopter Tour on Oahu! This tour is our finest offering and is far and away our most popular tour. This grand adventure includes everything in our other helicopter tours but continues on past Sacred Falls, over the Polynesian Cultural Center, one of Hawaii's most popular visitor attractions, and the Mormon Temple in Laie. 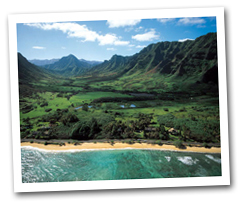 You'll also see Turtle Bay, the aquaculture farms and Kahuku Point. Don't be surprised if you see humpback whales offshore here during the winter months. The tour continues along the storied North Shore, with a dramatic view of world-renowned surfing spots including Sunset Beach, Pipeline and Waimea Bay. On your way over Oahu's Central Plain, you'll see the Dole Pineapple maze and the "birthing stones" of Hawaiian royalty. Your tour concludes with a panoramic vista of Pearl Harbor. Approximate tour time is 60 minutes.